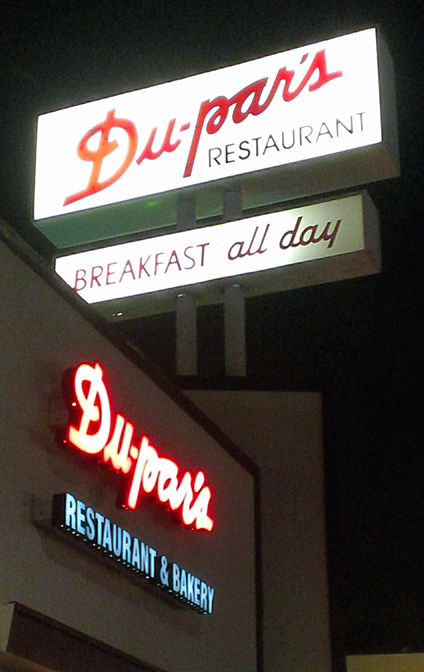 (1948) Du-pars, Studio City | Remains of L.A.
Was planning on staying in last night but started feeling stir crazy, so I drove out to Du-Pars in Studio City for a late dinner. -Golden chandeliers, lovely reddish Oriental carpet with a sort of ornate star design, rose marble counter with tall black chairs in front of it, a long row of booths–round booths against the windows and tall-backed two-person booths across from them, two large rooms of tables, lots and lots of potted plants, black and white photos on the walls showing scenes from the early days of Du-Pars, a bakery display of incredibly delicious-looking treats, old-timey ads for different flavors of pie scattered around on the walls, a high shelf holding ornate old pitchers. The whole place is incredibly comfortable and homey. -They’re known for their pancakes and pie, both things I can’t eat (sugar!) so I got the beef stew in a bread bowl and, for dessert, a cup of fruit (I know, I think it’s sad too). The stew was wonderful, the bread bowl was delicious, the fruit cup was exactly what it should be. -My booth had high backs and at first there was no one in the two round booths across from me, so even though I could hear people all around I felt sort of tucked away and hidden. I was so comfortable, sitting there, I absently curled my feet up onto the seat beside me. When the waiter brought my food he looked a bit askance, and I quickly put my feet down. -Some people were led past me on the way to be seated. One, a tall young woman with a short gray bob, looked at me as she walked past and laughed. It wasn’t a mean laugh, more a “Hi! Isn’t this place delightful? We’re all having such a great time!” sort of laugh. -When my beef stew came I had quite a time deciding whether to use the spoon or the fork. It was so thick I decided on the fork, with the option to switch, and found I’d made the right decision. I did pick out the potatoes, they were a bit hard, but I think that was more of a personal preference thing. Everything else in the stew was just wonderful and perfectly done. -At one of the booths across from me, a family was seated–mom, dad, and two girls. Both girls seemed to be about the same age, so they might have been friends, but they looked like sisters, so maybe twins? The non-identical kind? They were both clearly excited to be out so late, and kept clarifying that if they got pie, they could also have ice cream on it, in slightly astonished voices. -There was a woman near me who looked nothing like Gilda Radner when she didn’t smile, and exactly like Gilda Radner when she did smile. I bet people who know her just constantly try to make her smile. -In the ladies’ room, there was no toilet paper on the spindle (it was fine, there was more stacked by the toilet so I replaced it) and the spindle had this weird picture of a monster on it. I couldn’t figure it out; it looked like one of those rub-on transfers, but why? Who would take the time to do that? -My fruit cup came while I was in the ladies’, when I sat back down I realized I had no fork. It only took a moment to flag down the waiter and he was much more upset about the omission than I was. -I didn’t want to go home yet after I was done eating, so I ordered some hot tea. I have a silly thing with tea; I loathe herbal tea and for a long time there was no caffiene-free tea I liked but then I found out about rooibos but almost no restaurants carry it. So now I keep tea bags in my purse, but I don’t like to just order hot water because that seems so rude; they can’t really charge me for it only I am taking up a table and using their cream and splenda. So I order tea, specifying that the bag should be on the side, and then stealthily switch it out. I’m always worried the waiter will notice the tea packaging but either they don’t or they just don’t care at all. But it always makes me feel a tiny bit nervous and sneaky. -I asked for cream for my tea. I don’t know if that’s unusual (surely not?) or what but it took a long time and several requests to get my cream. It was fine, I was just sitting and reading and was perfectly happy anyway, but it took a really long time. Maybe he had noticed the tea bag switch and was being passive aggressive? -Everyone in the restaurant seemed really happy, all talking and laughing and enjoying one another. There was something about the place that made it seem like every single table was there to celebrate something. -I sat and drank my tea and read for a long time after I finished eating. Every now and then the waiter would bring me more hot water. -As I was leaving, there was an elderly couple standing by the door. The woman was wearing a black evening gown with a long silver scarf and a bejeweled snood. The man was wearing a tuxedo and had a tightly curled mustache. I’ve never seen a snood in real life, not worn for a costume, I don’t think. What I Read While I Ate: Finished“Counterfeit for Murder,” a Nero Wolfe story by Rex Stout. Check out this line, from when the narrator Archie is informing his enemy Police Sergeant Stebbins of the latest murder: “He pronounced a word which it is a misdemeanor to use on the telephone.” Isn’t that just the best? What Sort of Ghost I’d Expect to Find if I Believed in Ghosts Which I do Not: Two little kids who always begged to go to Du-Pars whenever the family went out to eat, and always used more syrup and butter than seemed possible on their pancakes. Note: Unless otherwise stated, all ghosts mentioned in this blog died peacefully of old age and then reverted to the age/place of their choosing. 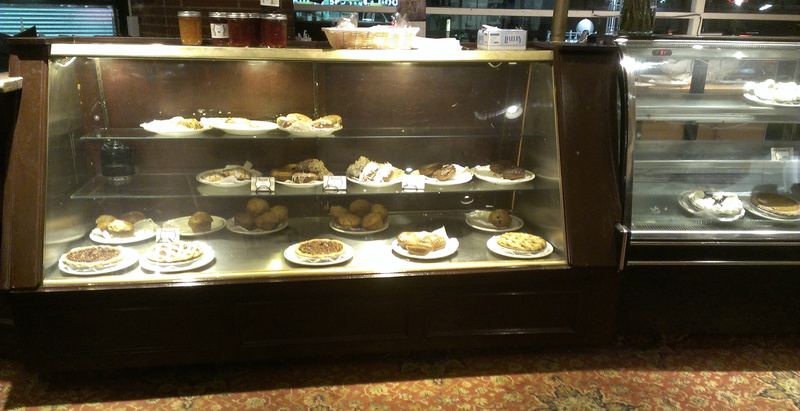 Categories: Uncategorized | Tags: 1948, Diners, Los Angeles, Restaurants, retro, studio city, vintage | Permalink.